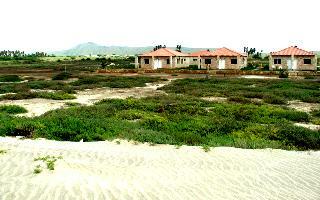 The bungalow is in front of a 8 kilometers lonely white sandy beach. The bungalow is semidetached on one side. 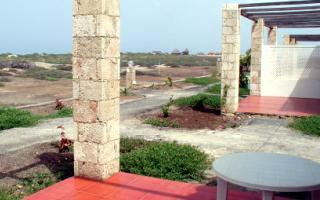 It is build with natural stones and wood in traditional Cabo Verde style. 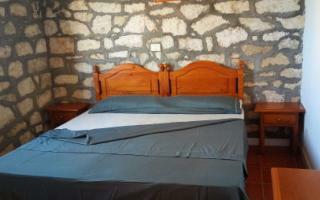 The bungalow is composed of 2 double bedrooms, 1 livingroom with kitchen, and a bathroom with shower. It can be rented for 2, 3 or 4 persons. Each bedroom has 2 beds that can be put together or separately. There are bungalows with kitchen and without kitchen. 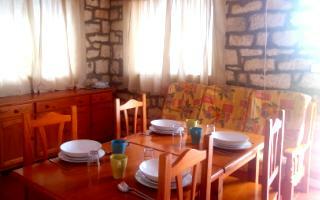 The kitchen is equipped with fridge, kitchen sink, 2 gas hobs and oven and complete crockery for 4 persons. The electricity and hot water is produced with solar energy. We use ecological energy sources exclusively. Because we produce the electricity with solar panels, there are no television in the bungalows and apartments. Power of the electricity is 220 V like in Europe. 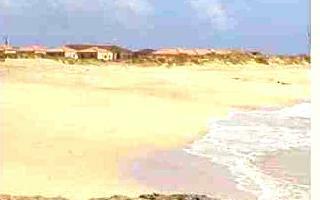 From the terrace, you walk 20 meters and you are in the beach.